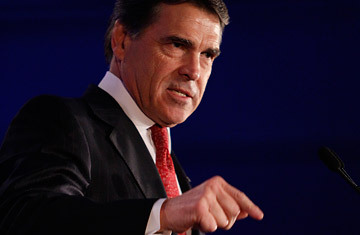 Texas Governor Rick Perry grabbed headlines over the weekend as the latest Republican to announce a run for President. He is also making news for some extreme political positions, including his claim that Social Security is unconstitutional. The Supreme Court resolved this question 74 years ago, but Perry and some other Republicans are raising the possibility that the courts could one day strike down the Social Security Act. Perry has taken a number of stands that might be described as outside of the political mainstream. He has questioned the wisdom of the 17th Amendment, which took the power to choose U.S. Senators away from state legislatures and gave it to voters. He has also mused about the possibility of Texas' seceding from the union. Last week, the Daily Beast released the transcript of an interview with Perry from last fall. He was asked about his assertion in a book he had written that Social Security is a "failure" that "we have been forced to accept for more than 70 years." Perry called Social Security a "Ponzi scheme" and pressed for a "legitimate conversation about let[ting] the states keep their money and implement" their own version of it. Perry not only argued that Social Security is bad policy but also questioned whether Congress ever had the power to enact it. He argued that the Taxing and Spending Clause allows Congress to levy taxes and spend money only in limited areas. He said he doubted that when the founders gave Congress this power they were "thinking about a federally operated program of pensions." The idea that Social Security is unconstitutional has long had a following on the far right, and other elected officials have made a similar case. Texas Congressman Ron Paul, a fellow Republican presidential candidate, has also argued that Congress did not have the power to enact Social Security and that the constitutional law on this point "has been mistaught in our schools" for a long time. But if Perry's candidacy takes off, the attack on Social Security could reach new levels of prominence. Social Security critics do not like to talk about the fact that the Supreme Court definitively put the question to rest in 1937. After Congress adopted the Social Security Act at President Franklin Roosevelt's urging, it was challenged on constitutional grounds. In Helvering v. Davis, the Supreme Court upheld the act by a 7-2 vote. Justice Benjamin Cardozo, writing for the majority, said the Taxing and Spending Clause authorized Congress to levy taxes and spend money to advance the "general welfare" and that Congress was within its right to find "that the award of old age benefits would be conducive to the general welfare." In its opinion, the Supreme Court also powerfully reminded people of why Congress had passed the act. "The hope behind this statute," Justice Cardozo wrote, "is to save men and women from the rigors of the poor house, as well as from the haunting fear that such a lot awaits them when journey's end is near." Many people today do not realize what the Supreme Court and the general public understood in 1937: before there was Social Security, most elderly Americans were condemned to live their final days in abject poverty. After they stopped working, many old people were forced to move in with family and friends. Others had to move into poorhouses. One study of Massachusetts almshouses in the early 20th century found that 92% of the residents were over the age of 60. Even if most Americans do not know these details, they believe that Social Security is vitally important to the general welfare. In a Wall Street Journal/NBC News poll conducted earlier this year, more than three-fourths of respondents said they did not want to see Social Security benefits cut. This support has, at least so far, put a political force field around Social Security. In 2005, President George W. Bush began his second term with an initiative to try to privatize Social Security. It went nowhere. At the outset of the recent spending fight in Washington, there were calls from Republicans and some Democrats to cut Social Security, but they, too, failed to gain traction. The overwhelming popular support for Social Security, and the failure of political assaults on it, may explain the attacks on the program's constitutionality. Conservatives used to oppose "judicial activism" and argue that courts should not use the Constitution to overturn the will of the elected branches. But lately, on issues like campaign finance and affirmative action, conservative courts have been striking down liberal laws. Some Social Security critics may believe that their best chance of ending the program lies not in Congress but in the Supreme Court. See how President Obama's Social Security tactics hurt bipartisanship. See how Social Security fits into the debt debate.